Longtime readers may know that I spend a lot of time reading Sheila’s Book Journey site, and she challenged readers to listen to audiobooks in the month of July. I am not normally an audiobook person, but my current job has me in the car between 2 and a half and 3 hours a day, so it makes sense that I use this time to NOT listen to the radio. 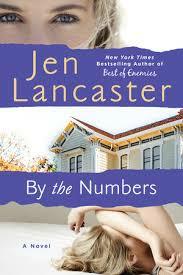 I picked up By the Numbers by Jen Lancaster on Audible. Due to the length of time I am in the car, the 8 hour and 55 minute audiobook ended up being completed during the week (due to the holiday, I found myself listening at work with my headphones a little bit. I found myself thinking about the characters, and wondering about different ways the story could end. It’s definitely an easy read, and I was able to figure out the ending a few days before the end, but that’s not why I listened to it. I listened to it because I wanted to get back into audiobooks (not just for a challenge), and I think I might be in for the long haul. Go check out BookJourney and find out more about audiobook month! What’s your favorite audiobook, please share in the comments below.